More than 250 community members celebrated Westchester’s 75th anniversary at a cocktail reception held at Loyola Marymount University on Thursday, October 27 hosted by the Westchester 75th Anniversary Committee in conjunction with the LAX Coastal Chamber and Loyola Marymount University. At the event, longtime Westchester residents Mary Ellen Cassman and Rowena Ake were honored for being pioneer women who helped shape Westchester into the close-knit and engaged community that it is today. Cassman was recognized for being instrumental in the founding of the Westchester Family YMCA and the Airport Marina Counseling Service. Ake was recognized for helping blaze the trail for women in Westchester, as the first woman in the Westchester Rotary Club, as well as its first woman president. Ake was also the first woman president of the LAX Coastal Chamber. Both women were presented with a giant ceremonial “Key to Westchester” by Karen Dial, President of the Drollinger Charitable Foundation and Drollinger Properties. Congresswoman Maxine Waters, Assemblywoman Autumn Burke and Councilmember Mike Bonin were also on hand to celebrate and presented the women with certificates from their offices. During the ceremony, Councilmember Bonin announced that Tuesday, December 6 would be declared “Westchester Day” at L.A. City Hall. The community is invited to head to council chamber’s on that date to be part of the special presentation. 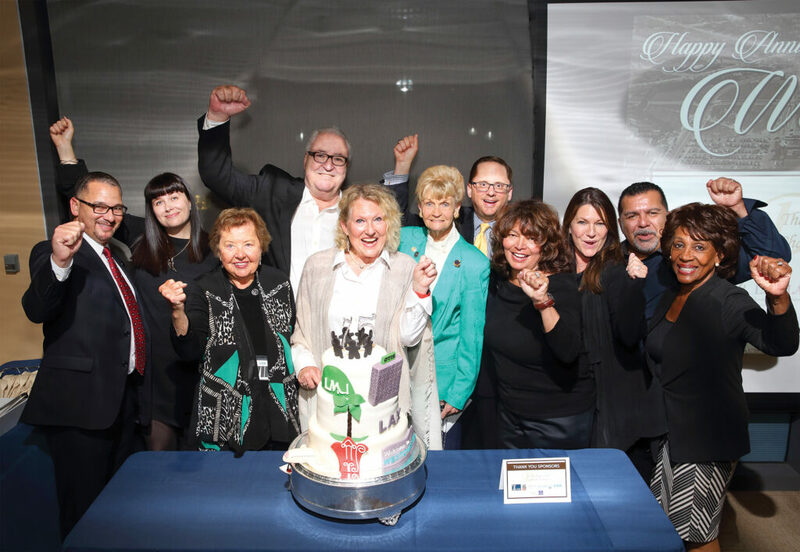 Caption: Community leaders, including representatives from the Drollinger Charitable Foundation, the LAX Coastal Chamber, the William H. Hannon Foundation, Westchester Rotary and AMCS, get ready for the ceremonial cake cutting at the Westchester 75th Anniversary Cocktail Reception. They are joined by Congresswoman Maxine Waters (far right). Photo by Glenn Marzano.